The Continuously Variable Filter (CVF) (a.k.a. Linear Variable Filters) from Delta Optical Thin Film is a wedged filter possessing spectral properties that vary continuously along one dimension of the filter. The CVF offers an extended set of performances within a single filter. A single CVF for instance can replace many fixed filters in an instrument. The center or edge wavelength can be adjusted by sliding the filter. Delta Optical Thin Film has taken the quality of variable filters to a whole new level by introducing a new robust combination of CVFs. The company offers a Linear Variable Long Wave Pass filter (LVLWP), the corresponding Linear Variable Short Wave Pass filter (LVSWP) together with a Linear Variable Dichroic. Each of the filters can be used individually. Combining LVSWP and LVLWP enables the creation of band-pass filters that can be tuned continuously with center wavelengths from 320 nm to 850 nm, with the extra advantage of tunable bandwidth. As LVF monochromator, the filters are employed in fluorescence microplate readers. Apart from setting new standards in edge steepness and transmission level, the filters offer blocking better than OD3 over the full reflection range. The blocking can be increased to beyond OD5 by placing another CVF in series. The filters are coated on single quartz substrates for high laser damage threshold and least auto-fluorescence. All of Delta Optical Thin Film’s CVFs are coated with ultra-hard surface coatings (UHC) that are also used by Delta Optical Thin Film in traditional fluorescence filters. Delta Optical Thin Film's CVFs are particularly suited for applications in spectroscopy. 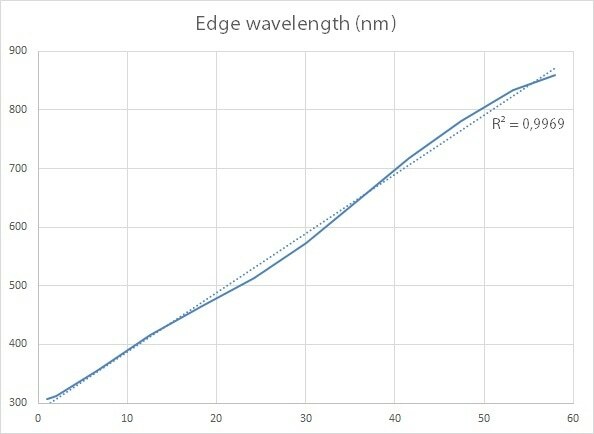 3G Long Wavelength Pass filter: Edge to be tuned from 310 nm – 850 nm, blocking down to 190 nm when edge at maximum wavelength, steeper edge. Steeper edge and broader blocking range than previous generations. The term Linear Variable Filter (LVF) suggests that the relation between center or edge wavelength versus position along the filter is linear. However, in fact this is not exactly true. Delta Optical Thin Film A/S used the term LVF because it was coined many years ago – long before the company started to produce this type of filters. The ideal term however is CVF. For various purposes, it is possible to design the function of edge or center wavelength versus position along the filter purposely non-linear, for instance exponential to compensate for angular effects or the alteration of bandwidth with center wavelength of variable bandpass filters. In fact, a second type of non-linearity. 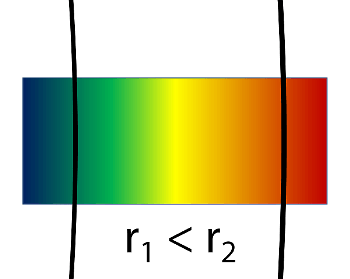 This concerns the shape of lines of constant edge or center wavelength perpendicular to the wavelength gradient. Due to the production process, the lines of constant edge or center wavelength are ring segments. Their curvature radius alters along the filter and is large compared to the filter's dimensions.